Better product quality and environment friendly polymers. 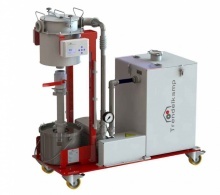 The new generation of the TK-V extruder degassing units from Trendelkamp efficiently extract unwanted gases from the extrusion process during operation. The system power can be adjusted to the corresponding application thus saving energy and water consumption. The systems utilize a temperature controlled steam chamber, in which the condensation process takes place. On a closed water circuit system, the liquid ring vacuum pump is supplied with the operating fluid.